Stock # A64005, 6.0L DI V8 Turbo-Diesel Power Stroke Engine, 167549 mi. Thank you for visiting another one of Auto Source of Texas's online listings! 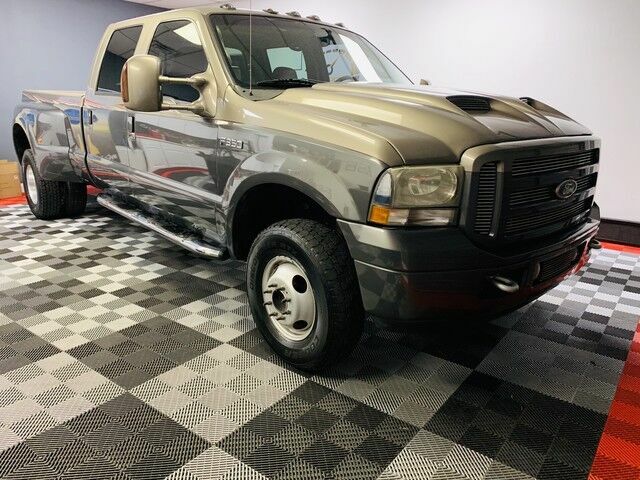 Please continue for more information on this 2004 Ford Super Duty F-350 DRW Lariat with 167,549mi. This Ford includes: UNIQUE LARIAT LE MONOTONE PAINT ELECTRIC SHIFT-ON-THE-FLY TRANSFER CASE PREMIUM ELECTRONIC AM/FM STEREO RADIO W/IN-DASH 6-DISC CD CHANGER CD Player AM/FM Stereo CD Changer 5-SPEED AUTOMATIC TRANSMISSION W/OD 5-Speed A/T A/T LEATHER FRONT LUXURY CAPTAINS CHAIRS W/CONSOLE Leather Seats Bucket Seats CLASS V TRAILER HITCH RECEIVER Tow Hitch LARIAT LE PKG Tires - Front All-Season Integrated Turn Signal Mirrors Power Mirror(s) Heated Mirrors Woodgrain Interior Trim Heated Front Seat(s) Rear Bucket Seats Running Boards/Side Steps Bucket Seats Tires - Rear All-Season 6.0L (364) DI V8 TURBO-DIESEL "POWER STROKE" ENGINE Diesel Fuel 8 Cylinder Engine Turbocharged *Note - For third party subscriptions or services, please contact the dealer for more information. * Drive home in your new pre-owned vehicle with the knowledge you're fully backed by the CARFAX Buyback Guarantee. This vehicle comes with 4WD for better traction on unstable surfaces, like snow and dirt to give you the edge over anything you might encounter on the road. The Super Duty F-350 DRW Lariat is well maintained and has just 167,549mi. This low amount of miles makes this vehicle incomparable to the competition. Added comfort with contemporary style is the leather interior to heighten the quality and craftsmanship for the Ford Super Duty F-350 DRW There are "other vehicles" and then there is the Ford Super Duty F-350 DRW Lariat. It is one of the most unique vehicles on the market, and you would be hard pressed to find another dealer offering something quite like this Ford. This Ford Super Duty F-350 DRW Lariat comes standard with features that are essential in the 21st Century. However, Ford decided to take it one step further and add a handful of quintessential options that will undoubtedly add to this vehicle's quality and value. Pre-owned doesn't have to mean "used." The clean interior of this Ford Super Duty F-350 DRW makes it one of the nicest you'll find.